The play "Honchô Nijûshikô" was originally written for the puppet theater (Bunraku) and staged for the first time in the 1st lunar month of 1766 in Ôsaka at the Takemotoza. It was adapted for Kabuki a few months later and was produced by both Nakamura Utaemon I and Mimasu Daigorô I in Ôsaka at the Naka no Shibai [casting]. The "Jusshukô" scene is performed for the first time with the actors Arashi Hinasuke I, Arashi Sangorô II and Yamashita Kinsaku II in the roles of Princess Yaegaki, Katsuyori and Nureginu. "Takenoko Hori", or "Digging up the Bamboo Shoots" is the 3rd act of the drama "Honchô Nijûshikô". It is made up of 4 scenes. The staging of "Takenoko Hori", which used to be very popular, is nowadays a rare event. It is sometimes revived as part of a tôshi kyôgen production. On each side of the border between the territories of Takeda Shingen and Nagao Kenshin, which crosses the Kikyô field, servants of the two feudal lords mow grasses and begin quarreling over trespassing. 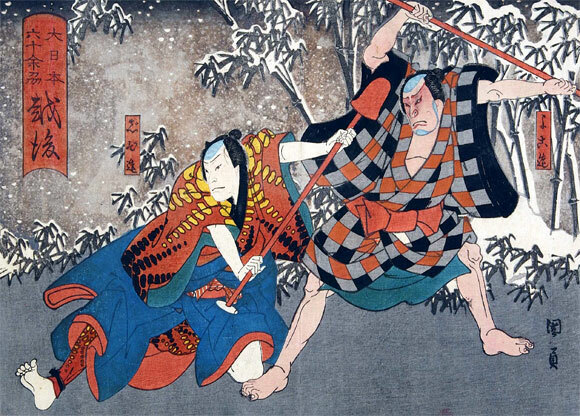 Karaori, wife of Shingen's chief retainer Kôsaka Danjô Tokitsuna, and Irie, wife of Kenshin's chief retainer Koshina Danjô Tadamasa, appear and take over the quarrel, speaking ill of each other's husbands, but are restrained by the servants before the dispute becomes too serious. Jihizô, the second son of the late great strategist Yamamoto Kansuke, brings a male infant and abandons him, placing him across the border with his feet in Shingen's territory and his head in Kenshin's territory. Kôsaka Danjô passes by and, finding the infant, notices that a tag bearing the name of Yamamoto Kansuke is attached to him. Considering that the infant is somehow related to the strategist, he tries to take him home when Koshina Danjô appears and claims that he has the right to have the boy because his head were in Kenshin's territory. Kôsaka Danjô refutes him, saying that his feet, which was in Shingen's territory, is more important than the head. Karaori and Irie take part in the argument and propose to settle the dispute by seeing which the infant will prefer, Karaori's bosom or Irie's. As the boy ceases crying in Karaori's arms, Kôsaka Danjô and Karaori take him home. Yamamoto Kansuke's widow Koshiji lives with her first son Yokozô, second son Jihizô and his Wife Otane, who was known as Yatsuhashi when she was in the service of the Ashikaga household. Otane is nursing a male infant named Jirokichi, who is in fact the son of the late Shôgun Yoshiharu and his mistress Shizu-no-Kata. As Shizu-no-Kata died soon after she gave birth to Jirokichi, Yokozô took him over and brought him to his home. The arrogant Yokozô forced Jihizô to abandon his infant son, Minematsu, so that Otane can give full attention to Jirokichi. Kagekatsu comes to the front of the house, wishing to employ Yokozô, whom he met at the Suwa Myôjin Shrine, ostensibly as strategist. Inside the house Jihizô kindly tries to take care of his mother but the old woman not only rejects his attention but also tries to beat him with a stick, accusing him of his selfish desire to succeed to his father's name. As she steps forward one of her wooden clogs slips off her foot. Kagekatsu immediately picks it up and reverently offers it to her. He then tells her the purpose of his visit. The old woman is astute enough to know that Kagekatsu wants to use Yokozô, who closely resembles him, as his substitute when he is to be put to death in accordance with his father's promise three years ago. As she agrees to comply with his request, Kagekatsu takes his leave after presenting her with a box. Yokozô returns home, carrying 10 little birds he has caught. He says he will eat the birds by himself, not offering any of them to his mother. He has his mother massage his feet. Karaori brings Jihizô's son Minematsu, whom she picked up in the Kikyô field, and, calling the infant Takeda Shingen, says that Shingen himself has come to invite Jihizô Strategist, but Jihizô's mother flatly refuses her request. Karaori leaves the infant outside the gate, saying that Shingen will stay there until he receives a favorable answer, and hides herself nearby. As Otane, taking pity on her son, holds him to her breast, Karaori comes out of hiding and goes away, saying that she is convinced that Jihizô will side with Takeda Shingen now that his wife has embraced the boy. Soon after this Minematsu is killed with a dagger thrown at him*. Meanwhile, Jihizô has been asked by his mother to get bamboo shoots from under the snow in the bamboo thicket adjoining the house. While he is digging the ground, his spade strikes something hard, which is supposed to be a chest containing the secret books of strategy hidden by his late father. Yokozô, who has been spying on Jihizô's action, suddenly appears and claims the secret books. The brothers quarrel and come to blows, each trying to get hold of the secret books. Their mother opens the doors and tells the brothers that the time has come for them to take service. She reminds Yokozô of the fact that Kagekatsu saved his life some time ago, so Yokozô owes him a great debt. Since Yokozô closely resembles Kagekatsu, she says he will be able to serve as Kagekatsu's double when Kagekatsu has to kill himself. At this moment a dirk is flung onto Yokozô. He seizes it and gouges out his right eye with the dagger to his mother's great astonishment. He tells her he now no longer resembles Kagekatsu and cannot act as his substitute. Yokozô thus makes it clear that his allegiance is not to Kenshin but to Shingen. Jihizô then enters, wearing formal dress, and declares that he will serve Kenshin. Karaori appears from the inner room, holding Jirokichi in her arms. Yokozô declares that Jirokichi is the son of the late Shôgun. He opens the chest dug up in the bamboo thicket and takes out a white flag, the banner of the Shôgun household. His mother confers her husband's name Kansuke Yamamoto on Yokozô and at his suggestion gives the secret books of strategy to Jihizô, saying he hopes to compete with him in the battlefield as strategist belonging to the opposing forces. (*) Minematsu is not killed by Yokozô; the murderer is none other than his own father Jihizô because Minematsu is now on the Takeda side and Jihizô has already rallied the Nagao clan (as we'll learn at the end of the last scene). Killing his son is the only way to preserve his loyalty to the Nagao clan. "The conduct of Yokozô and Jihizô is considered admirable, although to the Western playgoer they both appear to behave with extraordinary inhumanity towards the persons nearest and dearest to them." The role of Koshiji, the mother of Yokozô and Jihizô, is one of the three sanbaba.